Cory's books are now closed. He will be opening his schedule for July/August/September on June 1st, 2019. Please contact us then to schedule tattoo appointments. Ryan's books are now closed. He will be opening his schedule for July/August/September on May 1st, 2019. Please contact us then to schedule tattoo appointments. Cory and Ryan are still scheduling consults. Please contact us through www.redarbortattoo.com for more information. We tattooed this as part of a full sleeve. The client sat like a rock and we chiseled away at this native/animal themed sleeve. I really enjoy working on animals and had a lot of fun working with the client. The redness comes from irritation of the skin and goes away after a day or two. I forgot to get a good healed photo of the tattoo, but what we have still gets the point across. Check out our new merchandise that we are selling for a limited time only! 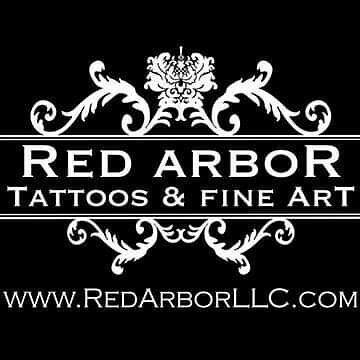 Get your Red Arbor Tattoos & Fine Art Shirts here! For new projects, Cory will be raising his hourly rate to $180 and Ryan will be raising his to $150 starting on March 1st. Current projects will stay at previous rates until the end of the year/completion of project. Thank you all for keeping them busy! Cory's books are now closed. He will be opening his schedule for April/May/June on March 1st. Please contact us then for tattoo appointments. Cory is still scheduling consults. Please contact us through www.redarbortattoo.com for more information. Ryan has availability in March and April, please contact us through www.redarbortattoo.com to set up a consult and to schedule an appointment. Once again we have been awarded as one of the "Top 3 Tattoo Shops" in Sioux Falls by ThreeBestRatedcom. You can read more about their 50 point inspection by clicking here. We do our best to tattoo exactly what our clients are looking for and to exceed expectations. Here at Red Arbor Tattoos, we strive to give a relaxing environment to help clients feel comfortable as we go through the process of creating the best tattoos we can. Check out more of our work on instagram and and facebook. We have also added a quick post to our google page with similar information that can be found here. We would like to introduce our newest tattoo artist to Red Arbor Tattoos. His name is Ryan Tieszen and he has been tattooing since 2010. He has worked in many shops and is a Sioux Falls local. More of his biography can be found on our artists page here. He has already shown his dedication to tattooing while attending a tattoo convention not too far away from Minneapolis, MN. 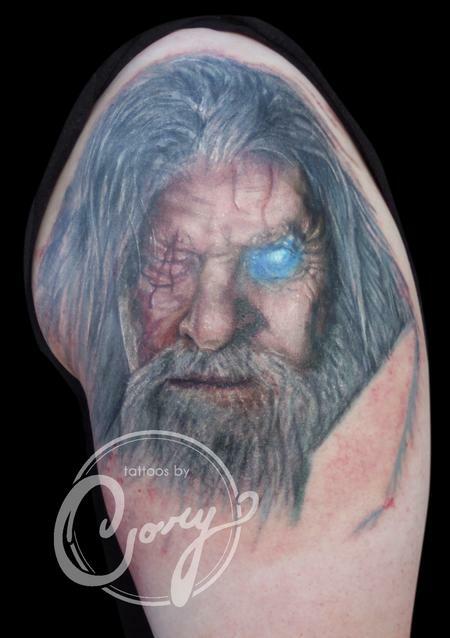 He won 1st place best portrait at Walker, MN Northern Light tattoo convention hosted by Tattoo You. Check out more information on our google post by clicking here. Halloween is a very fun time of year for our artists at Red Arbor Tattoo. We not only enjoy the festivities, but also appreciate the history. According to the Time's article The Real Reason People Carve Jack-O'-Lanterns for Halloween. The reason we call pumpkins Jack-O-Lanterns is based on how a man named Jack, tricked the devil. Jack was a cheapskate and was a mischevious individual. He enjoyed playing tricks and pranks on people. One day, he wanted a pint of ale, but didn't have any coins to pay for it. He bargained with the devil to turn into a coin so he could pay for his drink in return for his soul. As soon as the devil tranformed into a coin, Jack grabbed him and put him in his pocket with a small cross and trapped him. Jack was able to make the devil agree to never take his soul and he freed the devil. Jack not only fooled the devil once, but there are other stories where he fooled him many times. Every story is a little different, but they all end with Jack finally passing away and isn't allowed to enter heaven due to his shennanigans. Upon reaching the gates of hell, the devil keeps his word and doesn't allow Jack to enter. Instead, Jack had to walk the earth for eternity while carrying a lantern made out of a turnip and hot coal. Originally, people used turnips, but now our culure has evolved into using pumpkins to ward off evil spirits. The client sat through a long session in a painful spot on the top of her thigh. She sat phenomenal as we finished up this tattoo. There wasn't just one realistic cat portrait, but 2. The cat portraits were a lot of fun and I enjoyed putting them into the ornate frame. Realism tattooing is always fun, especially when working on pet portraits. Realistic pet portraits can take a lot of time (anywhere between 4 to 10 hours). I'm not sure the exact total time, but it was a long session. Especially since the previous day, we tattooed her other thigh. We added the ornate frames to help contrast the realism as well as give a border. They help to give a finished look to the piece instead of making it look like a floating head. I had a lot of fun working on these, and would love to do more. If interested, contact us through the contact page to this website. Thanks for looking! If interested in adopting any pets, check out Sioux Falls Area Humane Society. Cory's tattoo books will be opening again on December 1st for January/February/March time frame. Until then, he will be taking consults by appointment. For more information, please go through the contact page of www.redarborllc.com and send an email. Cory's schedule is booked through September. He will begin booking tattoos for October/November/December dates on August 1st. We are currently going through some policy changes to better accommodate our clients. In an effort to simplify communication and Cory's schedule, we will not be scheduling any tattoo appointments for August/September until June 1st, 2018. Cory will then be scheduling for October/November/December starting August 1st, 2018. Please contact us then for scheduling tattoo appointments. Before scheduling a tattoo appointment, we prefer meeting for a consult. During the consult, the artist will determine if the piece is right for them. Cory holds consults at 11:30am and they usually last an hour. Please contact us through our website at www.redarborllc.com with any questions or for more information. This video gives a brief summary of what we recommend for aftercare. If you have any questions regarding your tattoo, feel free to send us an email at redarborllc@gmail.com. Newest tattoo video of Cory tattooing a lotus flower on the clients hand. Thanks for looking! A good start to a Valhalla themed back piece. View more news and videos at our youtube page. Dancing with Death Tattoo Time lapse. Tattooed this day of the dead tattoo a little bit ago. Will be uploading more videos soon! Tattooed this on a client that traveled from Colorado to Sioux Falls, SD. Had a lot of fun working on this tattoo. The tattoo is on the clients left shoulder / upper arm. We also etched in the coordinates for his favorite place onto the compass. Check out our newest timelapse video! Tattooed this on location at Red Arbor Tattoos in Sioux Falls, SD. Start of a sleeve, have quite a bit more we are planning to do with the sleeve, but it's off to a good start! Hope you enjoy the video. Here is the newest time lapse of a clone trooper helmet. During the research of this tattoo, found out that there were 2 different helmets used in the original Star Wars Movie. Some were used for close ups and others were used for the extras. I ended up getting ahold of one that resembled the stunt style of helmets and used it to take some photos to help catch the subtle shadows that seem to disappear in the movie footage. A lot of fun working on this. Tattooed on my wife Tawni in celebration of her military retirement. More videos will be coming soon as I finish up a couple projects. Feel free to check out more videos on my youtube channel. We often are asked if we tattoo minors. Although state law allows us to, we choose not to for many reasons. The screen shot is of a conversation with a customer regarding our age policy. Customer: "Why do you not tattoo minors when it's allowed in South Dakota at tattoo shops? That's why I got my first tattoo for my 16th brithday in Sioux Falls cause it's legal?" Red Arbor: "We appreciate your question, thank you for asking. While it is LEGAL, we don't think it's IDEAL. At the discretion of our shop we chose the policy to benefit the interest of the client. Tattooing a minor requires parental consent of the design, not just the event of tattooing. We've heard of conflicts of design ideas; request of the minor and what's artistically ideal versus what the parental figure allows. We have also heard of a couple matter via other shops where, example given, a minor with divorced parents brings the consenting parent in, recieves teh tattoo shop. We respectfully chose to avoid being a catalyst for family drama. We are not criticizing shops that chose to tattoo minors-in a lawful manner they are just complying with demand, but in a generalized perspective, any shop can use minors to turn a quick buck from occasionally impulsive tattoo decisions, sometimes made subconsciously just for the experience of getting a tattoo. We advocate though-out, strong designs that flatter the body, and hold up through aging. We prioritize art integrity and long term client satisfaction over profit. We think any individual desiring tattoo art is pretyy damned RAD! We are honored to be considered to create art for any individual. We also respect every client enough to opt for waiting to tattoo them over money. Your concenpt IS badass! We'd be privileged work on that with you, but we understand if you do not want to wait. We hope our explanation is at least repected as well as understandable." Other considerations are maturity level. Many peoples interest change rapidly from 16-20. The body may still be growing which can distort a tattoo quickly. We believe there are too many variables to ensure our work will hold up over time and our clients be happy with the tattoos for years to come. Had a lot of fun with this tattoo. Will be adding a background to this later. We spent around 7 hours working on this and will be cleaning it up as we move onto other parts of his leg. I love working on portraits, especially when they are superheroes! Did this time lapse awhile ago. Had a lot of fun working on this tattoo and looking forward to tattooing more portraits. Red Arbor is excited to announce their Sioux Falls Chamber of Commerce Ribbon Cutting! On December 3rd at 4:30pm an open house/grand opening reception will follow until 8pm. We just finished a new tattoo video! This was a lot of fun to make and we plan on doing more in the future. You can also check out our facebook page at facebook.com/redarborllc or follow my instagram @tattoosbycory. As of today, we are officially opened to the public for tattoo appointments, tattoo consults, fine art paintings, and fine art consults. Our goal at Red Arbor, LLC-Tattoos&Fine Art is to provide high quality works of art maximizing experiences of clients by skillfully designing work embracing principles built on visual fine arts. We Embrace the opportunity of transcending ideas into visually strong art forms diversified with meaning and pride. We do our best not to be interupted while working directly with clients while they are at our shop in Sioux Falls, SD. We specialize in portraits with both tattoos and oil paintings. Check out our Facebook page or Google+ page for our locations. Feel free to call us at 605-610-1340!